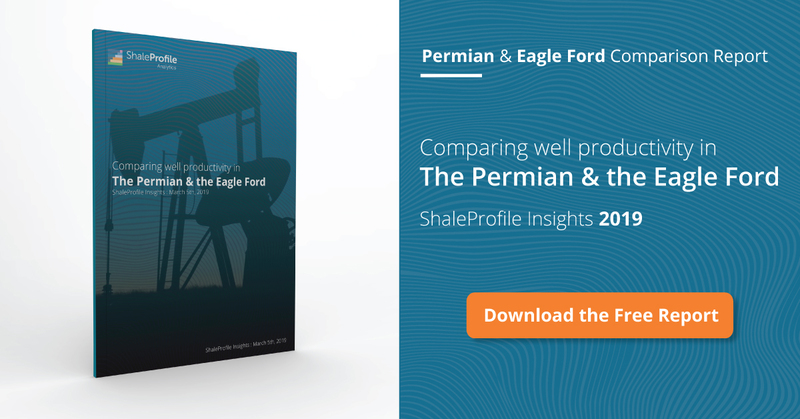 This interactive presentation contains the latest oil & gas production data through January 2018 from 20,338 horizontal wells in the Eagle Ford region (TRRC districts 1-4), that started producing since 2010 . Oil production has rebounded after hurricane Harvey hit the area in August last year to a level of about 1.2 million barrels of oil per day, or ~6% higher than a year ago. The light blue area shows that in December almost half of this production came from wells that started producing in 2017. As usual in Texas, production for the last few months is still incomplete, and I expect that January production will also eventually come in at a similar level as in December. This incompleteness in reporting is especially caused by delayed reporting of new wells. This can be seen in the ‘Well status’ tab, where I’ve selected the status ‘First flow’, i.e. the number of wells that started producing each month. You can see the significant drop after October 2017 (168 new wells in October, vs 59 in January), which I belief is not the reality. Although initial productivity is up (see the ‘well quality’ dashboard), the increase is not as large as we’ve seen in the Permian or the Niobrara, and therefore the response in drilling activity is not as strong. Most operators are not yet back to their previous output records, although EOG and Chesapeake, the number 1 & 2 (see ‘Top operators’), are close. In contrast, operated production from Devon has dropped by ~75% in 3 years to a level of around 50 thousand bo/d, mostly due to natural decline. In this “Ultimate Recovery” overview the relationship between production rates, and cumulative production is revealed. Wells are grouped by the quarter in which production started. The steady increases in initial production rates are also visible here: A well starting in the first quarter of 2012 peaked at a rate of around 320 bo/d, while this is more than double for recent wells. The EURs that these newer wells are tracking are also higher, but apparently not with the same percentage. In the 4th tab (‘Productivity ranking’), the performance of operators is shown by the average cumulative production in the first 24 months. Of the operators with more than 100 wells, Devon, ConocoPhillips, and Encana show the best results. Tooltips are available in the chart that show the number of wells operated by each of them. Clicking on any of them in the chart will show the location of the wells in the map below. Texas RRC. Production data is provided on lease level. Individual well production data is estimated from a range of data sources, including regular well tests, and pending data reports.